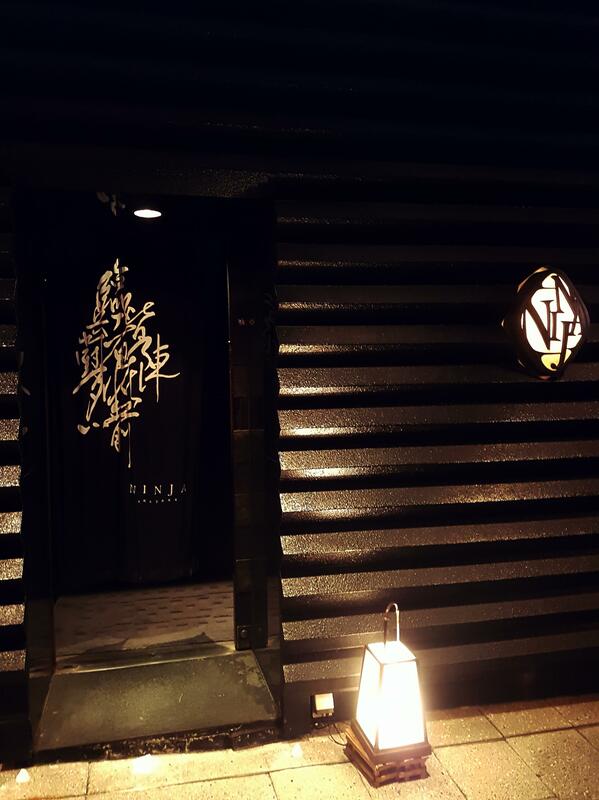 I was actually quite excited when our friends told us about this Ninja themed restaurant in Akasaka, Tokyo so we made a reservation early to give it a go (reservation is a must). The location itself is not so “secretive” and was easily accessible by subway, a five minute walk from Akasaka-Mitsuke station (赤坂見附駅), but the entrance is discrete, in line with the rule where a Ninja’s presence must remain unknown. Once inside, a friendly Ninja takes you through hidden doors and dark narrow corridors to your secluded private dining room. Our first room was close to the smoking zone so we asked to move and the staff were more than happy to accommodate our request and moved us to another mezzanine floor room. We prebooked our menu and went for the Yamato SPIRIT (大和魂コース) and Jyubei (十兵衛), a ¥6,999 (AU$84) 11-dish and ¥15,000 (AU$180) 10-dish course respectively. There’s always a concern that food is a let down at gimmicky places like this but it turned out decent, especially when you look at it as an overall experience. I’m not sure the price difference between the Yamato and Jyubei menu is justified though. Course #6 from the Yamato menu was quite interesting where they literally boiled the soup and vegetables with really hot stones. Food was decent and served at a good pace by our Ninja waiter who kept us entertained with Ninja tricks and magic throughout the course of dinner. Overall it was a nice experience, much better than visiting the Maid Cafe on our last Tokyo visit, but I think this is one of those try-it-once things.